I sang The End” by the Beatles every time I thought about what I wanted to write today. “The End” was the last song on the last album the Beatles ever recorded together. This is the last time this exact group of writers will gather together to share slice of life stories. Tomorrow we’ll go back to our weekly Tuesday Challenge. The group probably will be smaller. And next March, when we host the 8th Annual Slice of Life Story Challenge, it is my hope we’ll add new members to our tribe of writers. Therefore, this is our last hurrah together. I’ve loved sharing the past month with you. Thank you for being part of this community. To that end, thank you for trusting the members of this writing community with your stories. Also, thanks for being a supportive audience for each other. I hope you’ll be back on Tuesdays year-round to continue the writing habit you’ve created this month by sharing a slice of your life with the rest of the Slicer Community. Once again, I’m sharing slices from two people today both of which deal with frustrating situations. Katy Collins (@misscollins606) crafted “This Moment Brought to You Because of Winn Dixie” after a vacation mishap with one of those automated self-checkout machines. Carol Wilcox (@carwilc) wrote “More parenting from afar. A dog?!!!?? ?” after having an aggravating phone call with her college-age son where they just couldn’t see eye-to-eye on a situation. The name/username you used this month, your blog’s URL, the state or country in which you live, the number of days you sliced and linked by 11:59 p.m. EDT. If you started between March 2nd – 7th, please make note of that too. Post your permalink to your slice of life story and the information requested above by 11:59 p.m. EDT today. Thank you for another wonderful year. I look forward to going back and discovering some of the newer bloggers and visiting some more of my favorites. Have a wonderful Spring! Oops…sorry for the second comment. I sliced and linked by 11:59 for 28 days. I turned into a pumpkin on 3 days (I think this is an improvement over my past two years). Next year, by golly, I’m gonna make that deadline! I sliced and linked by 11:59 pm (EST) for 31 days. Thank you for the opportunity to write, the venue to read fellow Slicers, for your support, and for a chance to shake off the winter blues. I sliced and linked by 11:59pm (EST) for 29 days. Coming to the party late tonight. I had a lot to say! Loving listening to The Beatles as I post this! Thanks so much to everyone! Taking a bit of a break, but see you NEXT Tuesday! Like many I’m sure, today is a reflection on this month’s challenge. Thank you to everyone involved from the organizers, to my fellow bloggers, to all the commenters. I appreciate this opportunity to grow and learn alongside so much talent. I sliced and linked by 11:59 (EST) for 30 days, one slice was a few minutes short EST time. Oops! I posted before reading the instructions. The month is over and I’ve learned a lot through this challenge. This is it, everyone! April is going to feel pretty weird. See you on Tuesdays! 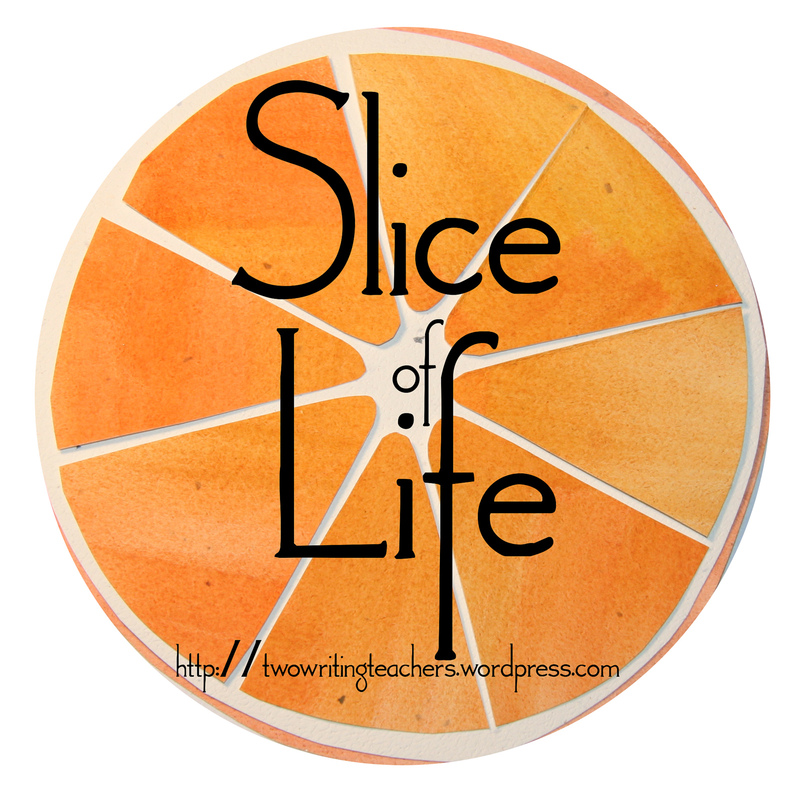 I survived the Slice of Life challenge and am so much better for it! I sliced and linked by 11:59 EDT for 29 days. I started on the first but I’m not sure if I got it published correctly. I had difficulty figuring all of the technology out the first few days! I sliced and linked by 11:59 PM every day for 31 days! Jeez, is it over already??? Loved reading your words. Yes, you. Thank you for being part of my journey this month. I sliced and linked by 11:59pm (EST) for 31 days. Sorry, I forgot to give credits! I sliced and linked on time for 27 days. I started on March 3rd, missing the 1st, 2nd, 3rd, 7th, and 8th. I’m ending on the same note that I began this month-long journey. This has been a fun month of writing and reading slices…see you all on Tuesdays! I sliced and linked by 11:59 pm EST for 30 days. Here’s my post for today. I DID IT! I sliced and linked by 11:59 for 31 days. Day 31! Yahoo! This is a post about selfishness and marriage. Both mine. Oh forgot the second part! I wrote all 31 days, had technical problems while traveling so 1 or 2 links didn’t work on this page and commenting was tough for awhile on my mobile devices. Sliced and linked for 31 days. Day 31: I DID IT!!!!! Thanks to this amazing opportunity and community! Wow! It’s hard to believe we are already at the end of the month. Today I’m taking time to reflect. I sliced and linked by 11:59 pm (EST) for 31 days. Woot woot!! The aftermath of emotional outbursts leave me drained and sad. Not unlike how I feel about the end of the month of slicing. Feeling like I am crossing the finish line! Moving on to a new challenge! Thank you everyone for a wonderful month! I sliced and linked by 11:59 PM EST for 31 days! I sliced and linked by 11:59 pm (EST) for 30 days. 4 more days….4 more days….4 MORE DAYS!!! I sliced and linked by 11:59 for 31 days although one day was posted on the student slice by mistake. Sliced and Linked by 11:59 EST all 31 days. Not satisfied with my last slice but then decided there is always Tuesday! That’s a good way to look at it, Tammy! I sliced & linked by 11:59pm EDT for 31 days! I love that April 1st is a Tuesday this year! Makes the transition a little easier, right? In the end…a poem. Things to do if You’re a Writer. I sliced and linked for 31 days! Thank you to everyone for another great year of a daily (almost on my end) writing community! The final slice for 2014 on a warm day. This was a fun month! Thank you, one and all! I sliced and linked up by 11:59 (EST) for 31 days. I sliced and linked by 11:59 pm(EST) days 2-31. On day one, I posted by midnight in Colorado because I hadn’t read the instructions carefully. Final Post 31: I made it! Congrats to everyone, it’s been a slice! I sliced and linked by 11:59 (EST) for 31 days! Thanks to everyone for another wonderful month of writing inspiration! Hooray for us for participating in personal development that may or may not also be professional development! I think I made it 29 out of 31 days! Today I share writing from another time in my life. I love words and I love capturing a moment, but boy it sure takes revision, reflection, and more revision. I recently read in Roger Rosenblatt’s Unless It Moves the Human Heart about an author that had written 150 pages of his/her novel and realized they were telling the story from the wrong point of view AND THREW OUT WHAT THEY HAD WRITTEN TO THAT POINT! Maybe I should do that, but I can’t bear to- so I am sharing it with you. Thanks for a great month. I sliced and linked by 11:59 p.m. EDT.31 days! This kind of blogging is the best! Here’s what I’ve read this month. It is past my bedtime! Sorry I didn’t get it right the first time. Last day – lots learned – inspired by so many. Thank you all. I’m looking forward to SOLSC 2015! Reflection, like so many of you! Literacy Coaching (and Teaching) Spine Poems–how much fun is this?!?! Username for SOLSC14: Chris H.
Grant’s play this morning connected me to our work together this month… Congratulations, everyone! Is it really over? I’ll see you tomorrow. Last slice for SOLSC: My Creative Spirit retired before March. Surprisingly I did fine without her. Last post for the challenge! How I feel…. Oops! I didn’t read everything. sorry. Sorry I forgot to add this information! I sliced and linked by 11:59 pm for 31 days. So many have sliced for 31 days! I sliced and linked by 11:59 pm (EST) for 31 days! Back to work today. A peek into my morning. I can’t believe another SOLSC is over! It was so fun to write and read for 31 days!! I love March. My final adieu. I was pushed way past my comfort zone, however all was worth the challenge. Whether my writing will continue via blogging is yet to be determined. Thank you all so much for the opportunity and the support. This has been a month of firsts for me. I wold like to share one memorable first. Hope it is not inappropriate and doesn’t offend anyone. The End! And since I’m on spring vacation, I’m finally posting before 10:00 at night. I sliced and linked by 11:59 p.m. EST for 31 days. Thanks to the army of people who made this challenge so rewarding! Sorry, I forgot to add this information to my link earlier this morning. Loved doing the SOL this year. Thank you for hosting it. Today I take you to the Arts Festival in Tempe. I sliced and linked by 11:59 p.m. for 31 days in March. Gratitude for the team of volunteers who made this possible and to Stacey and Ruth who started it all! ‘ll share a pic of our celebratory slicing cake tomorrow. I sliced and linked by 11:59 EDT for 31 days. Day 31- The end to an unbelievable month of writing!!! Thank you everyone for your wonderful Slice posts and comments and encouragement. I did it! I completed 31 of 31! *collapses happily* And since I am on a roll, I will be back tomorrow for the weekly Slice of Life. 31 days of writing. Writing provides me with a way to examine frustrations as well as joy. Today is about grief and loss. I sliced and linked for 31 days. Looking back on my month of writing…man it’s been fun! It’s fitting that the last Poemy Monday of the challenge is a farewell thank you of sorts. It’s been a really great month! It’s been a pleasure slicing with everyone. Congratulations to you for writing every day-a very big deal! Thank you…as a first time slicer, this was the BEST month of my writing life! I did post and comment for 31 days. I am from Arlington, Virginia. I sliced and linked by 11:59 pm (EST) for 25 days. Thank you all for a fabulous month of writing, sharing, reading, and supporting! Does the help button on the self checkout really bring help? http://peanutrwco.wordpress.com/2014/03/31/10-miles-coming-soon-to-a-race-near-you/ A ten mile race… I am not ready for. I’ve enjoyed reading so many new ‘slicers’….now that it’s a habit, we hope you continue! I can’t believe that the last day is here. Who intends to continue? I do. Today I write about the ordinary, but in reality a true gift. I linked up every day. Yay! Last day of our journey! Reflecting! I sliced and linked all 31 days! I sliced and linked 31 days. Here it is my final post I just needed to tell you….. Linked up by 11:59 pm for 31 days! I sliced and linked by 11:59 pm (EST) for 31 days. Woohoo! Note to Robin: My prize was participating, please don’t count me for prize selection. Instead of my usual “reflect” at the “end,” I went into the month’s posts and created a data slice of various elements of Slice of Life — from average number of posts, average number of comments, and the gender gap of writers. As always, it’s been a powerful experience to write and connect with everyone. Congratulations, fellow slicers and thanks to all who left comments. Hope to see you on Twitter. Thanks to all of you who read my slices and left comments. It’s been a great March challenge. I learned a valuable lesson about supporting a young storyteller yesterday. Note to Robin: While I wrote and linked daily for 31 days, please do not count me for a prize. Thank you again, Robin, for your help this month! I wrote 31 slices but 1 was after midnight! I apologize for posting twice today. I should have read more carefully. Reflecting upon writing in the merry month of March- Well done fellow slicers! A reflection on the last month of slicing. The End or Just the Beginning? Thanks for this community and this month! The many tools in playfulness’s toy box. Thanks for exploring her toys with me!